ProofHub allows you to use a custom domain name as per your preference. Click Manage from top bar and select Custom domain. Enter your domain or sub-domain like “www.mysite.com” or “extranet.mywebsite.com”. Do not enter “https://” or “https://”. Do not enter custom domain with a folder path like “www.site.com/folder”. Also, do not enter any URL that contains “proofhub.com” in it. 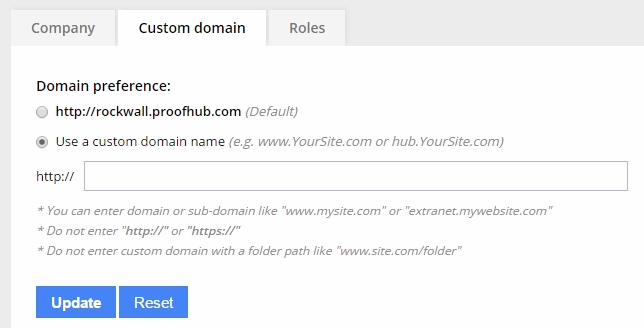 You’re done with redirecting your domain to ProofHub server through CNAME. A–Record: The other way to point your domain to ProofHub server is through A-record. Follow the registrar’s instructions to point the domain’s or sub-domain’s A-record to 173.255.232.157. It may take 24–48 hours for the change to take effect. 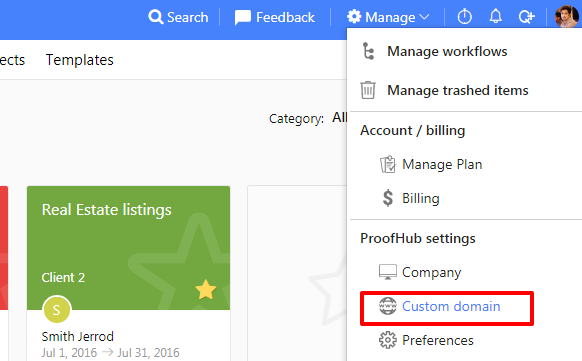 If the domain is setup properly, you should see your ProofHub account when you visit your custom domain.